Background: Cu2ZnFeS3 (CZIS) thin films were grown as a non-toxic material for use in photovoltaic cells as an n-type semiconductor. This material could work in synergy with p-type materials already existing in the market such as CdTe and Cu(In, Ga)Se2 (CIGS). 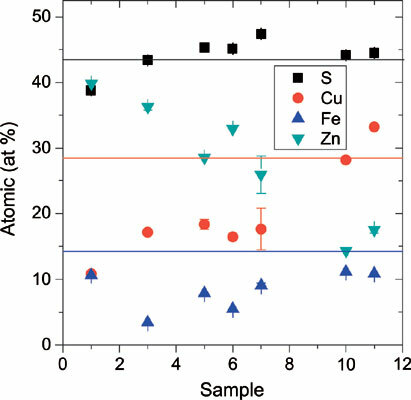 Thin films of CZIS were grown as a quaternary Cu2ZnFeS3 material by the co-evaporation technique under high vacuum from binary sulfides such as iron sulfide (FeS2), copper sulfide (CuS) and zinc sulfide (ZnS), each one individually optimized and characterized. Methods: In this work, the results were performed using different variants such as thermal annealing step in two different atmospheres such as under vacuum, and vacuum-sulfur and also at different temperature (500-600ºC) in order to obtain quaternary materials. The structural, optical, morphological, compositional, and electrical properties of the samples were characterized using X-ray diffraction, UV-Vis spectroscopy, scanning electron microscopy, X-ray photoelectron spectroscopy and Hall effect measurements. XPS results indicate that the samples are slightly rich in Zn and poor in Cu. Conclusion: The evidence of surface oxidation has also been noted. Nevertheless, the depth profile did not show a significant change in the signal or in the composition in the composition. From the UV-Vis analyzes, we obtained optical band gap values with 2.22 < Eg < 2.76 eV. The carrier concentrations were found to be in the range of 3.3 x1020 to 4.6x1021 cm-3, the mobility value was around 4.45-0.22 cm2 V-1s-1, and the resistivity values were determined in the range of 1.68x10-3 to 1.89x10-2 Ω-cm. PVD, Thermal treatment and sulfurization, non-toxic material, CZIS, UV-V, photovoltaic cells.